New Year’s Eve is famously celebrated all over the world – New York City drops its ball in Times Square, and countless folks all over North America set off fireworks. But, have you heard of the all day (usually two day!) party in Scotland that’s called Hogmanay? Pronounced “hog-ma-NAY”, this crazy, tradition-soaked, fun-filled revelry can last until the 2nd of January, which luckily is a bank holiday in Scotland. 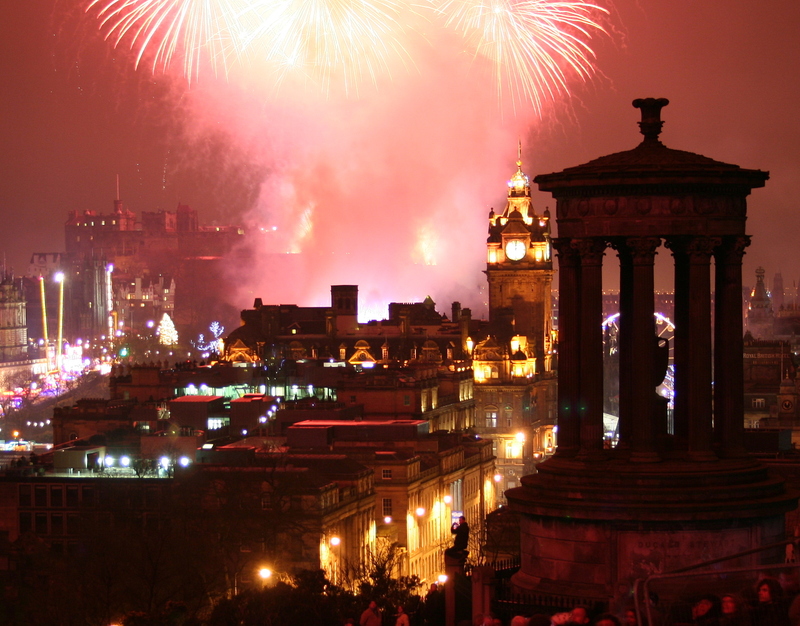 We’ve compiled some must-know facts about Hogmanay, so you’ll know exactly what you’re in for! First footing is a unique tradition that’s celebrated all over Scotland on New Year’s Eve. The custom goes that the first person through your front door in the New Year should be a handsome, dark haired male. He should be carrying food, and fuel. Items that are usually carried include a few pieces of coal, salt, a black bun, and some shortbread. The visitor should be welcomed with open arms, and a kiss (hey, it is New Year’s after all) and they should be given a ‘wee’ (small) dram of whiskey. The visitor is meant to bring good luck on your house and all those who live in it for the year to come. If he is fair haired then it’s said to bring bad luck. This tradition might date back to when Viking invaders (generally being blonde) meant that probably anything but good luck was headed your way. Every area of Scotland has added its own elements to their Hogmanay celebration. People in Stonehaven in the North of Scotland swing chicken wire balls, filled with paper and rags, which are attached to 3 meters of rope or chain. At midnight, revelers swing the lit balls of fire around their heads as they parade up and down the High Street. When the parade’s finished any fireballs that remain are thrown into the harbour and a fireworks display unlike any other caps off the night. Generally fireworks of all sorts can be found all over Scotland come New Years Eve. The Biggar Bonfire is one of the largest and more famous, found just after sundown in a place called Biggar. There’s also the Flambeaux Procession that takes place in Camrie, close to the Scottish highlands. Every year 8 giant fiery torches travel in procession through the town, before being thrown into the river. All this fire play harkens back to Pagan festivals of ringing in the New Year. The fire is meant to ward away evil spirits and chase away the bad of the old year. Other traditions that must be carried out before midnight on December 31st include cleaning the house and getting rid of any garbage (or ashes in the fire). You also need to pay all your debts before midnight. Then, last but not least, right after midnight strikes, Robbie Burn’s famous song, “Auld Lang Syne” is sung, and kisses are shared all round. If Scotland fascinates you, and the idea of New Years in Edinburgh makes you want to jump for joy, why not check out what English courses we have near you now? Start your New Year with a new language!